Sometimes all an architect needs to do is find the space within an existing site to make a project come to life. 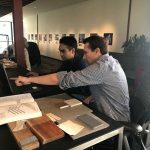 That’s what happened for David Pfeifer of domusstudio architecture as he began work on the first update at Nazareth School San Diego. The completed design project, which greeted students when they arrived for school this fall, included a new entryway and courtyard. 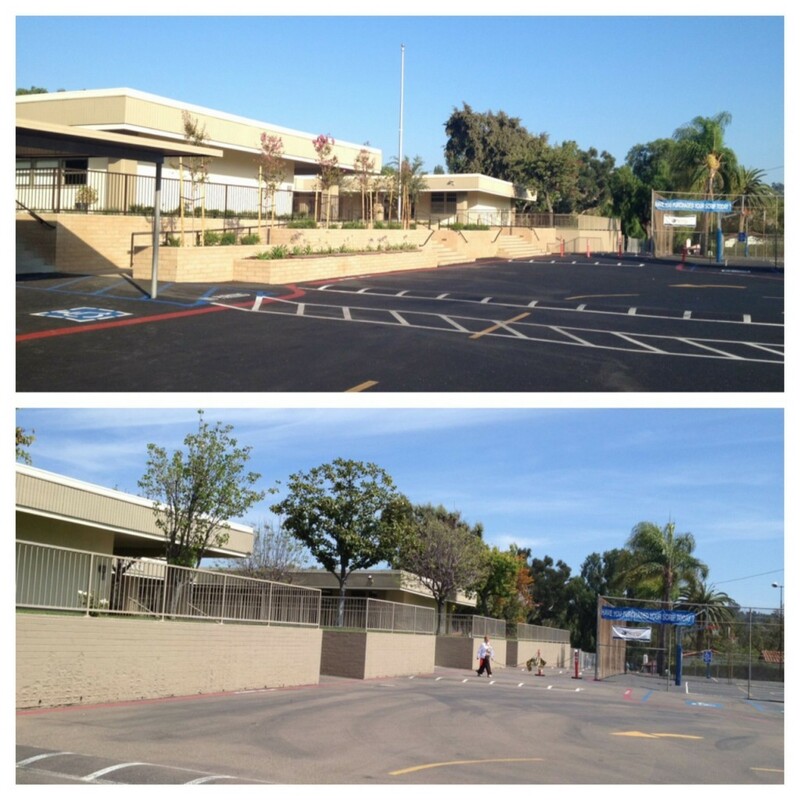 Today, the school, located in San Diego’s Mission Valley community, is putting its redesigned space to good use. Originally constructed in 1970, the school building sits 5 feet above the parking lot and was surrounded by 5-foot-tall retaining walls and guard rails. Domusstudio and their team looked for a way to reconfigure the existing entry and make it more open and welcoming – all while paying attention to students’ safety and accessibility issues. “As the project progressed, the gem we discovered was the underutilized space,” David Pfeifer said. “It was there all along – we just had to uncover it and make better use of it.” The gained space has become the physical heart of the campus. Part of that ‘found’ space was in the form of a wide cement ramp and stark retaining walls leading up to the school. “By replacing the ramp and walls with large, formal steps and tiered walls and planters filled with greenery, we were able to create a welcoming and gracious entry,” he added. The walls, made of 4-inch-high units to match the existing brick, were built with integrally colored concrete masonry and set at differing heights which create seating opportunities. The school now uses the area for regular assemblies during the school day as well as in the evenings for events and fellowship since new lighting was added. The domusstudio plan also reconfigured the ramp, which was not ADA compliant and had been a visual drawback at the school. The new one, now open and accessible for those with disabilities, is situated between the planters so it becomes an element of the entryway. Pfeifer noted that the integrally colored concrete provided a cost-effective, durable and attractive solution. The design also included a panel of brick pavers that can be used in the future for donor and memorial opportunities. The new entry is just a taste of things to come, as Nazareth School will again see construction during the summer. 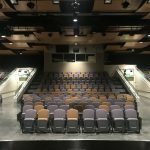 Domusstudio is working on a design to expand the auditorium, upgrade the restrooms and improve ADA accessibility inside. Pfeifer and the domusstudio team worked with landscape architect Deneen Powell Atelier Inc., general contractor Dreamscape Landscaping and primary subcontractor Mark Langer Masonry on the project’s first phase. 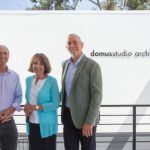 Domusstudio Architecture (established in 1986 as Dominy + Associates Architects) is an award-winning firm practicing creative, sustaining, enriching design including sacred, educational, civic (fire stations/libraries), senior housing and custom residential projects. For more information, call (888) 939-9393. View more before and after photos of Nazareth School by liking the domusstudio Facebook page here.